September 15, 2015 – To stay in the proper orbit, many satellites have thrusters–small rocket engines–that fire to change altitude or orientation in space. On Earth where gravity dominates, 5 pounds of thrust, equivalent to 22 Newtons of force, may seem small, but in space, it doesn’t take much thrust to move a large spacecraft. Currently, most satellite thrusters are powered by hydrazine, a toxic and corrosive fuel that is dangerous to handle and store. In a quest to replace hydrazine with a more environmentally friendly fuel, NASA is testing thrusters propelled by green propellants that can provide better performance than hydrazine without the toxicity. 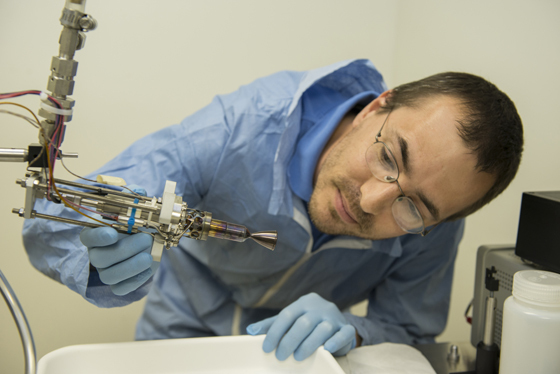 These propellants could help lower costs by eliminating infrastructure needed for handling toxic fuels and reducing processing time–making it less expensive and safer and easier to launch both commercial and NASA spacecraft. 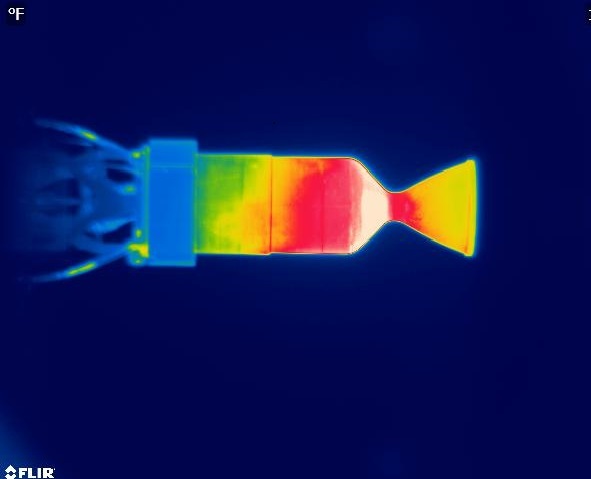 NASA recently completed several hot-fire tests with thrusters powered by two different green propellants with the potential to replace hydrazine. Both are ionic liquid-based blends that are less toxic and less flammable than hydrazine, which makes them easier and less costly to store, to handle and to fuel up spacecraft before launch. Additionally, the new propellants offer higher performance, delivering more thrust for a given quantity of propellant than hydrazine. One of the green propellants is a hydroxylammonium nitrate-based propellant known as AF-M315E. It was developed by the Air Force Research Laboratory at Edwards Air Force Base in California. This propellant will be demonstrated on a small satellite on NASA’s Green Propellant Infusion Mission (GPIM). During the GPIM flight, the smallsat will fire thrusters powered by AF-M315E to conduct maneuvers to change the satellite’s altitude and orientation. GPIM recently passed a major milestone with the delivery of the propellant’s propulsion subsystem built by Aerojet Rocketdyne in Redmond, Washington, to the mission’s prime contractor, Ball Aerospace & Technologies Corp. in Boulder, Colorado, for integration into the spacecraft. For this project, the GPIM team tested two different sized thrusters (1 and 22 Newton) with AF-M315E. Five of the 1-Newton thrusters will fly on GPIM. “With GPIM’s flight scheduled to launch next year, NASA and the aerospace industry have taken positive steps to demonstrate use of a propellant that will reduce satellite fueling hazards and save time and money during launch campaigns,” said Tim Smith, GPIM mission manager for NASA’s Technology Demonstration Missions at Marshall. GPIM is managed by STMD’s Technology Demonstration Missions Program Office at Marshall. The other green propellant is a fuel called LMP-103S, which is based on the oxidizer ammonium dinitramide produced by Eurenco Bofors in Karlskoga, Sweden. A team at NASA’s Marshall Space Flight Center in Huntsville, Alabama, recently completed tests with both 5 Newton and 22 Newton thruster built by ECAPS and powered by LMP-103S. 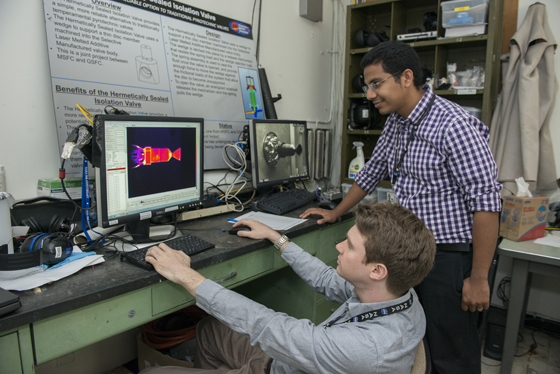 Engineers fired the 22 Newton thruster 35 times under varying conditions and monitored results with infrared cameras. Orbital ATK, Inc. assisted NASA with these tests. To guide future investments, NASA is leading the development of a green propellant roadmap along with other government agencies, industry and academic leaders who recently shared their collective experiences during a technical interchange meeting at Marshall.